I’m a tab hoarder in my browser and regularly have more tabs open than is really necessary, but often they’re made up of things that I want to write about. However, sometimes I feel like they require more research than I have time or energy for, so they sit there for month after month. This is one of those topics that I’m finally just going to post what I know and if anyone else has better or additional information, they’re more than welcome to share. 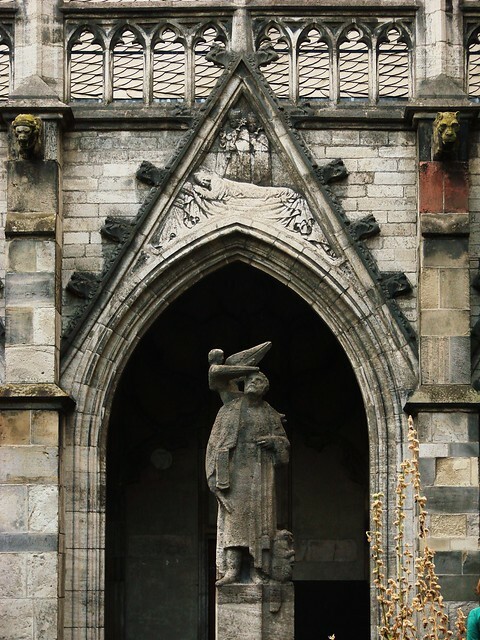 This post started because of this photo that I took of one of the statues in the Pandhof of the Dom cathedral. I can’t tell you how many times I’ve walked around it, looked at it, and in this case, photographed it, but then never gave it much more thought. I guess I was distracted by all of the gargoyles. But then, a few months ago, I finally wondered if it was a statue of a saint or someone else. Curious, I started Googling. 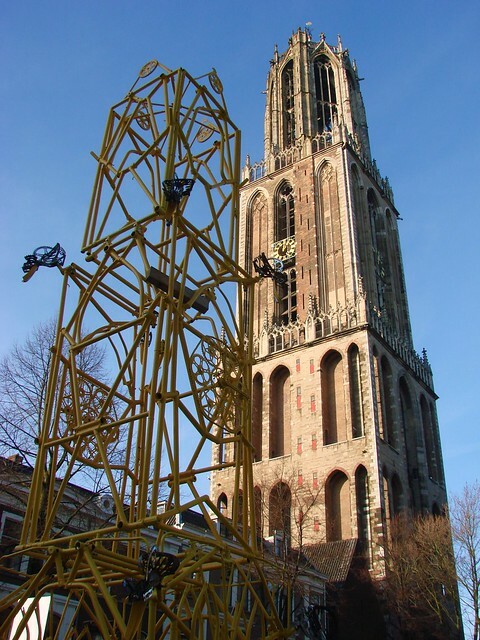 What I learned is that it’s a relatively modern sculpture of the first architect of the current cathedral and/or the Domtoren. There’s some confusion over the names, but it seems that he was known as Jan van Henegouwen, but sometimes misnamed as Jan van den Doem, who was a later architect. Not surprisingly, for a structure so large, the building process went on for a number of years and there were multiple head architects throughout the project. 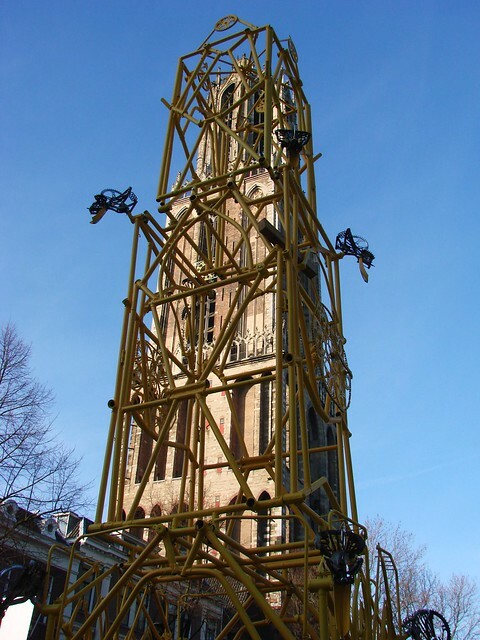 Some information lists Jan van Henegouwen as the first architect of the Domtoren, whereas Jan van den Doem is listed as the first architect of the cathedral and Pandhof. I do have a book that probably explains it all, but I’m short on time, so I’ll try to do some more research and update if I learn anything more. For now, a few details on this specific sculpture, though. It does seem to be meant to be Jan van den Doem, the architect of the cathedral and Pandhof. 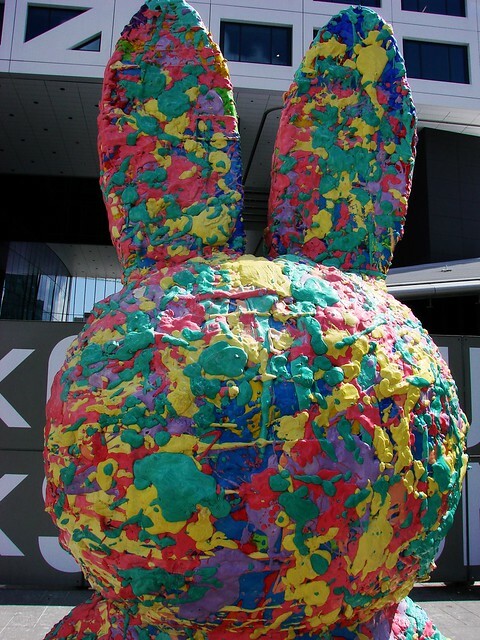 The sculpture was installed in 1989 (practically yesterday!) 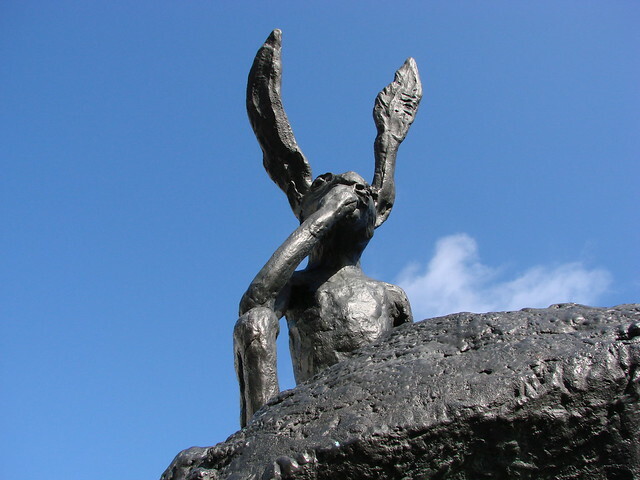 by sculptor Paul Grégoire (Amsterdam 1915 – Amsterdam 1988), presumably after his death. 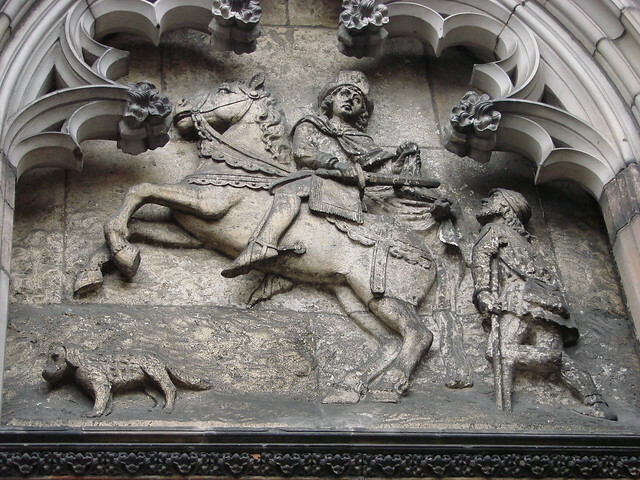 His son is also a sculptor, so perhaps he finished it/attended its installation. 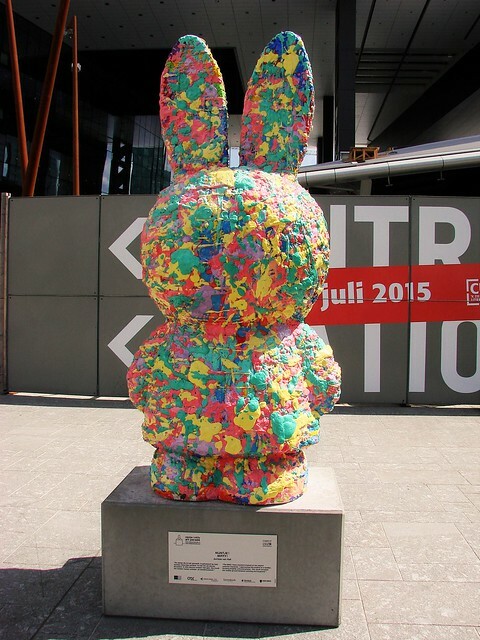 It turns out that there’s another sculpture by Paul Grégoire on Mariaplaats that I quite like. 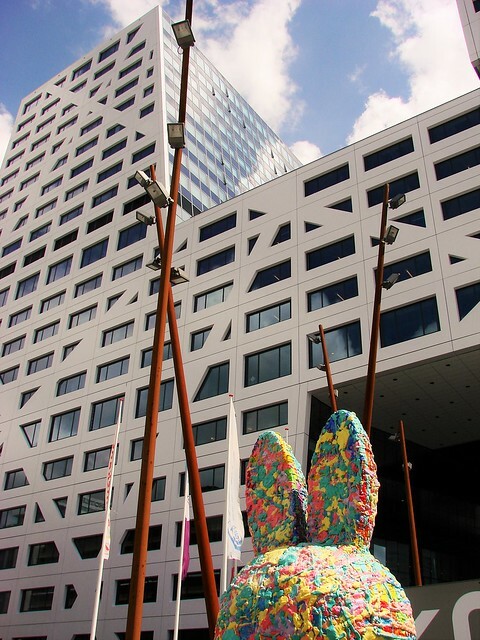 The sculpture of Jan van den Doem includes a beaver down by his feet and a plumb rule in his hand, symbols of an architect. It was a nice, “Ah! Of course!” moment when I finally found out the subject of the sculpture. Nice to think that the architect gets a bit of a nod after all these centuries! It’s been kerstmarkt (Christmas Market) weekend here in Utrecht, with markets popping up all over town. We hit them all, except the one at Mariaplaats, including the newest one at the Domplein. 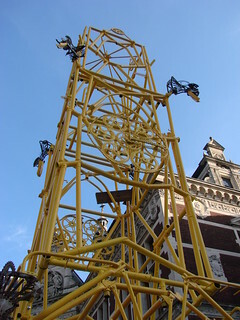 There will be many more photos to come eventually, but for now, I thought I’d share this fantastic version of the Domtoren, made completely out of bicycle parts. 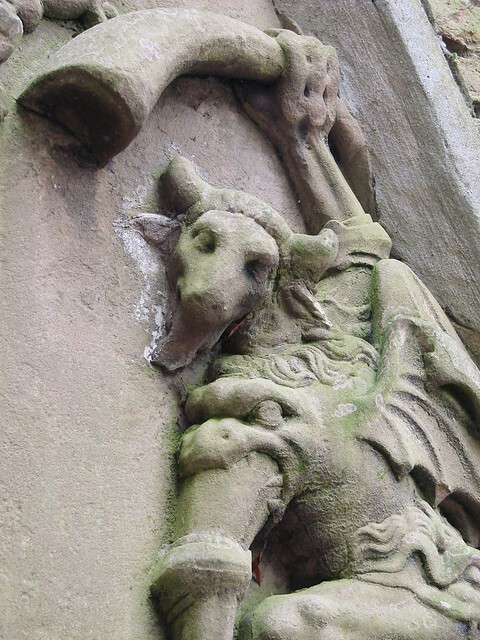 They even added in gargoyles made from bicycle parts! Brilliant! Eventually, I worked my way around to get the perfect shots. Proof that it pays to look at things from every angle! OMG, y’all! For the first time in more than a month, I left the house to go somewhere other than work! Six days a week, working two jobs, has left me little time or energy to do much of anything. But a quiet Sunday morning is one of my favorite times to go for a walk and with the heat abating a bit, as well, I set out for a short photo walk. I had the Stadhuisbrug in mind today for a specific reason. Today is the last 137 kilometers of the Tour de France. Next stop? 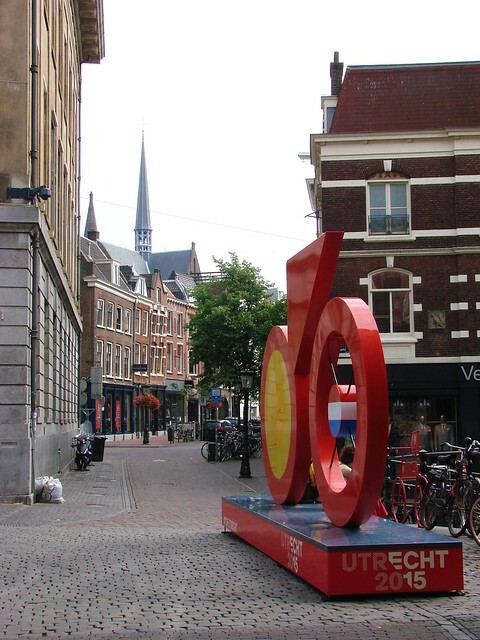 Utrecht! 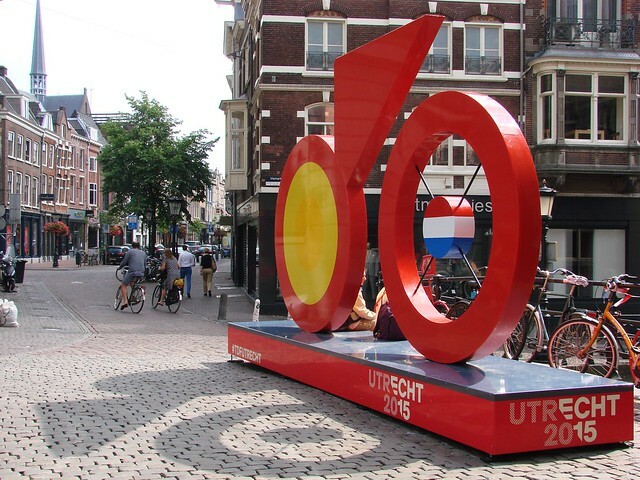 As I’ve mentioned before, Utrecht will be the site of the Grand Depart for the 2015 Tour de France. Various decorations, signs, and banners have been popping up around town already. 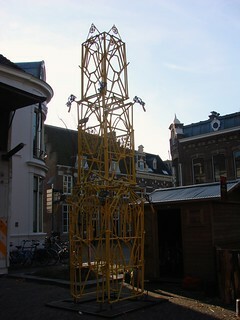 The latest is this sculpture on the Stadhuisbrug. 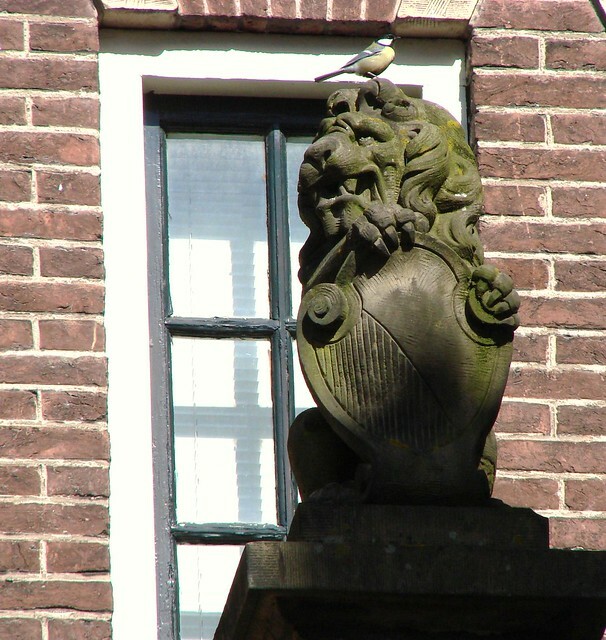 I learned from experience when another sculpture representing the Vrede van Utrecht (Treaty of Utrecht) was in the same spot that it is best to go when few people are around, otherwise it’s almost impossible to get a decent shot. There’s always someone on it or in front of it. Fortunately, the people who were on it today were on the other side and don’t show up too much and the nearby tour group was focused on something else. 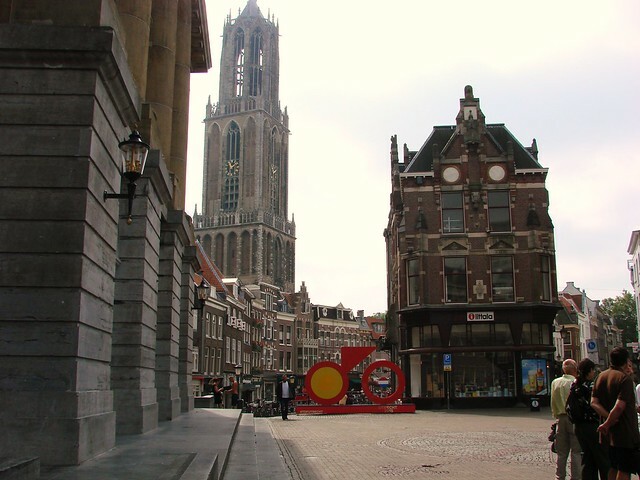 I managed to get it from a couple of angles, including with the Wilibrordkerk and its spire in the background, and one with a nice bit of shadow on the ground. I haven’t followed any of the race this year, despite my best intentions, but I really hope to get to see some of it here next year. They will be going down part of Biltstraat, although I think they turn off before they get to Vino Veritas, but I’d love to see them going under the Domtoren. Regardless, best of luck to the racers today. See you in Utrecht next year! 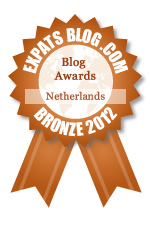 OK, not so wordless … Please vote for A Flamingo in Utrecht! This week I thought I’d share some of the random photos I’ve taken around town. Some are funny, some are interesting window displays, and others are quiet, pretty corners easily missed. 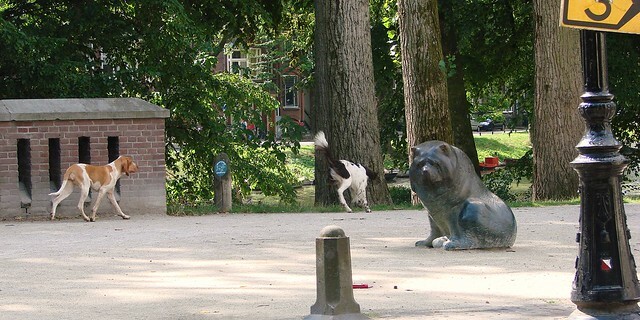 First up is the charming statue of Biru the chow chow, a sculpture by artist Joop Hekman. 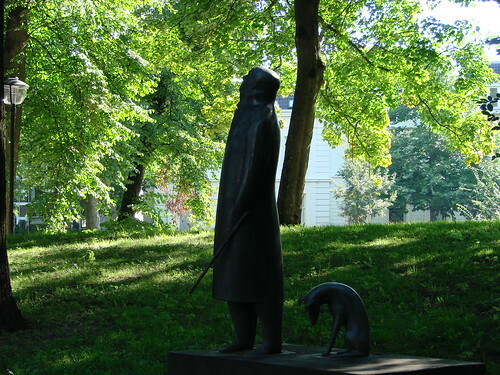 I had seen the other two dogs coming and had hoped that they would stop and give Biru a friendly sniff, but they were too distracted to pay attention to a dog of bronze rather than flesh and fur. I didn’t get the shot I wanted, but I was happy to get the shot I did. Throughout Utrecht, references to Sint Maarten (St. Martin) pop up everywhere. Perhaps not surprising, since he is Utrecht’s patron saint. The cathedral (where the above image is found) was dedicated to Sint Maarten,and the city’s coat of arms/flag is a visual reference to the saint’s history. I’ve mentioned the city’s red and white flag in the past and how it relates to Sint Maarten. The story goes that Maarten was approached by a beggar on the street. As a poor soldier, Maarten had no money to give and was not allowed to give away his military coat, so he got creative and cut his red coat in half in order to at least share it with the beggar. That night, in a dream, the grateful beggar revealed himself to be Jesus. 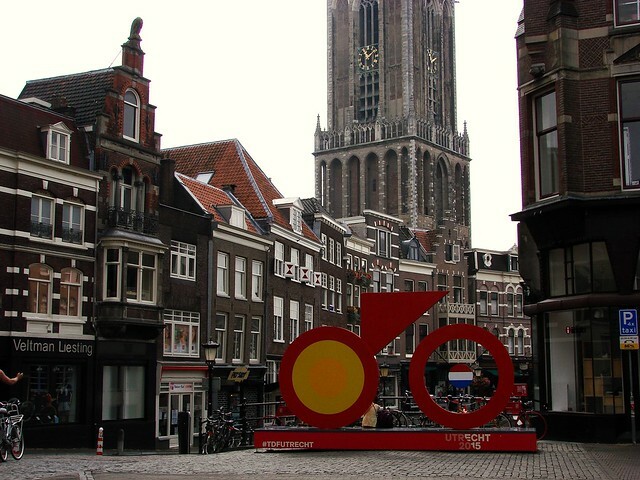 The city’s coat of arms (a shield divided diagonally into red and white) and flag (the same diagonal red and white) represent the red cloak and the white undershirt of Maarten. Although the story may be old, it seems to hold a special place in the heart of one local resident in the Wittevrouwen neighborhood. He recently commissioned a large mural of the saint for the side of his house. 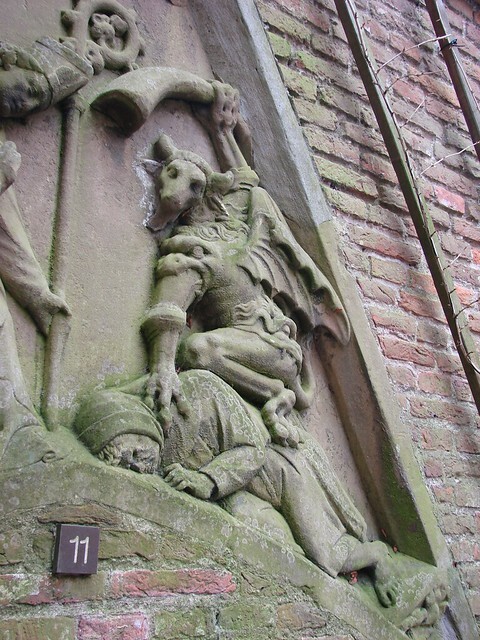 At the corner of Zandhofsestraat and Bladstraat, the story of Sint Maarten cutting his coat for the beggar is depicted against the backdrop of the historic old Wittevrouwen city gate. 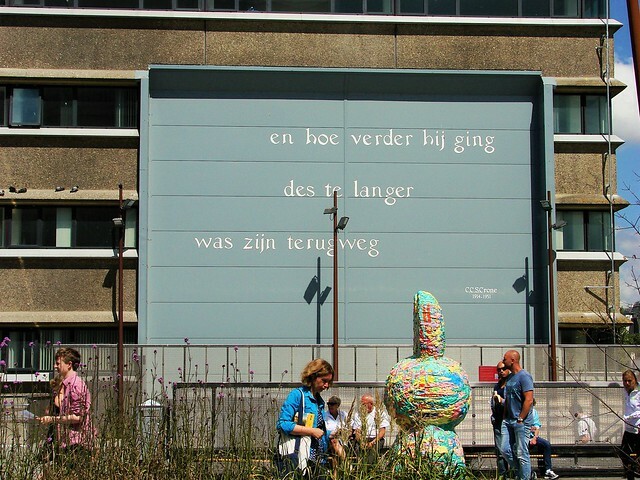 The mural was created by artists Zinzi Rozema and Marij Nielen (of the Makershuis Maanzaad), along with Jos Peeters. 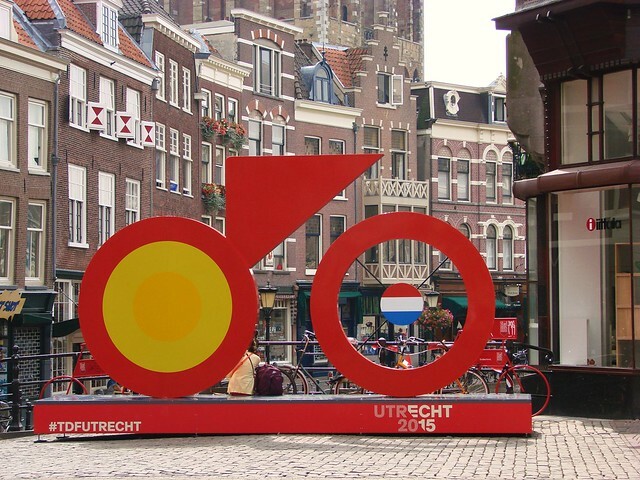 It’s a simple but striking image of two of Utrecht’s great symbols. 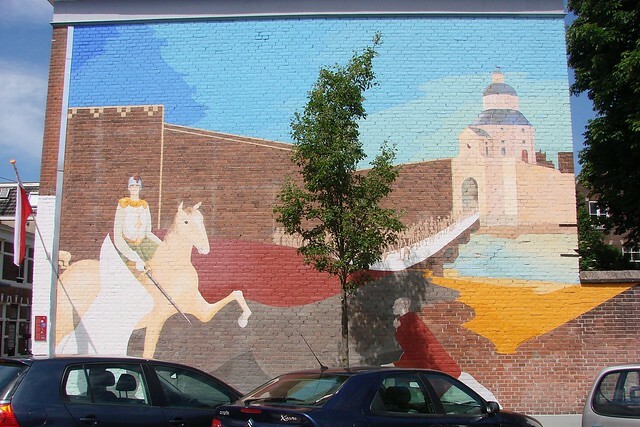 Rather appropriately, you can even see the Utrecht flag hanging to the left of the mural. I’m a fan of details, although looking at them more than doing them myself! This week’s photo challenge is “lost in the details” and is a bit more about getting up closer and looking at things from a new angle. I decided to have a bit of fun with the theme and include the “devil is in the details” theme, as well. 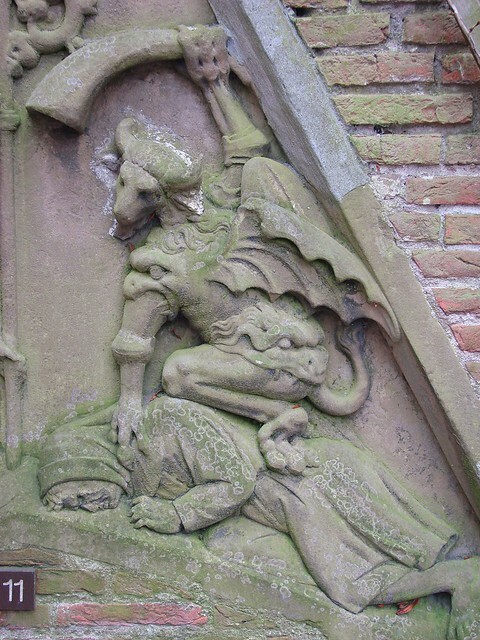 Today, after my stop at the Pandhof to photograph another gargoyle, I decided to stop in at Flora’s Hof (the garden next to the Domtoren) and get a detailed photo or three of this particular bas relief image depicting a moment in the life of a saint (Willibrord?). The sculpture is triangular in shape, but I decided to focus just on the devilish creature about to whack someone over the head. There’s some great detail just in the demon and his outfit. Chomping mouths everywhere! Then I moved in for a different and lower angle, which I like even more, because the person on the ground suddenly seems much more real. The whole image comes to life. So then I focused even closer on the demon. You can practically hear him — and his sleeve — cackling with glee as his sinewy claw is about to whoosh down upon us all! My beloved Spoetjik Kijker (Sputnik Watcher) became an F16 Kijker this morning. Around 10:30 this morning, I’m sure many people’s heads suddenly turned to the sky when they heard a loud noise up above. Even inside the house, I was startled by the loud, growling noise outside. It eventually became clear that it was a jet, but it certainly sounded different than the usual jet. We also don’t usually hear normal jets in the city center. Helicopters, sure, but not jets! It sounded disturbingly close and I had a moment of panic wondering if it was too late to move to safer ground, as visions of crashing planes filled my mind. It soon passed, but then was followed by another. G was upstairs and went outside to look. He was the one who confirmed it was a military jet. I checked Twitter, of course, and saw that a few other people had posted in surprise about the unexpected appearance and very loud noise. After surely many requests for information as to what was going on, the air force responded by saying that the two F16 jets were doing a reconnaissance flight and were taking urban photos as part of the exercise. There were some complaints as to how low the planes were flying, I think, but while I think the legal limit as to how low the planes can fly is an altitude of 360 meters, these jets were flying at 450, so they were well within the legal limits. At least there were no sonic booms! I remember quite a few of those as I was growing up in Orlando. I think we were close enough to various military groups and plane-related companies that the occasional sonic boom wasn’t unheard of. When the boom went, I jumped as did everything sitting on my dresser!